Strange Dreams and Free Coffee! I was quite excited when Saturday’s mail brought a cool surprise. I get tired of the advertisements that come from grocery stores and drug stores where I don’t shop. I generally just fold them up and put them in my recycling bag. I think from now on, I’ll at least look through them. 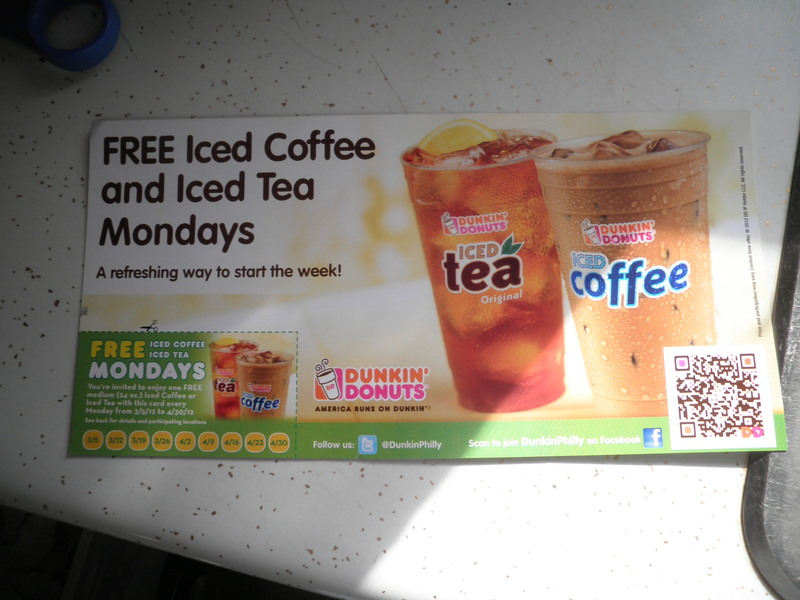 A punch card that will give me free iced coffee every Monday until April 30!! I was so excited. I had one of these in the fall and I really enjoyed it. 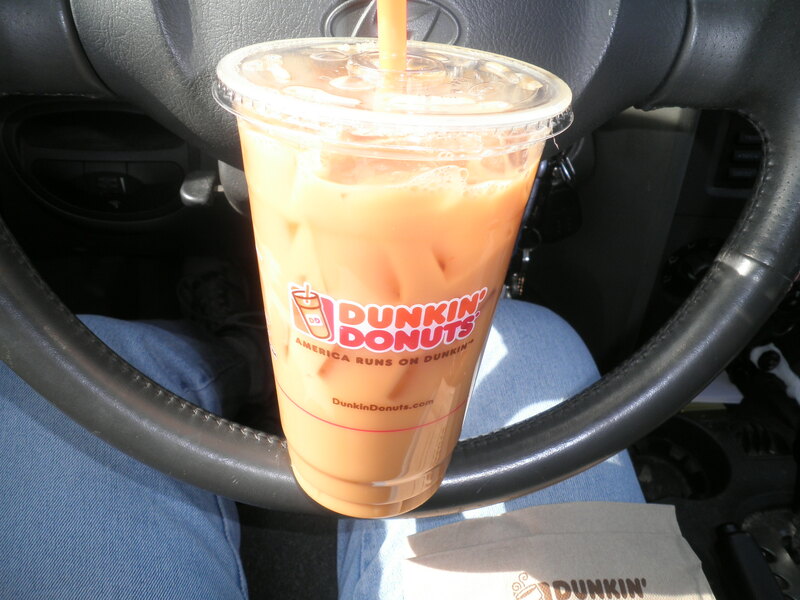 It was a little cold back then to drink iced coffee, but I only missed one week. That was for a month, this one goes through all of March and April. Hooray! On a completely different topic, does anyone else ever wonder where things come from that pop up in your dreams? I had such a strange dream last night that I can’t even talk about it here. In it received an invitation to something Very Strange. Other portions of the dream did involve people I know, but those people would not in my opinion be involved in these strange things. It has always fascinated me how things show up in my dreams. I should probably do research on it. I can understand that friends, loved ones and co-workers could show up in my dreams. I suppose TV and movie people could show up there. I’m not a fan of Brad Pitt, but he showed up in a very detailed dream one time. I suppose I should write these things down when they come to me. They might be the basis for a story or novel. Hmmm…Why did I never think of that before? I might be able to blame it on The Night Circus. It is a very intricate and involved story with many unusual characters. I’m more than half way through the book and there has been nothing as strange as this dream. It is wonderful though. If you haven’t read it, you should! I think I’ll be scratching my head all day trying to make sense of this dream. Maybe I need more coffee! Maybe I need less coffee! Either way, I’m sure my brain will keep working and formulating strange dreams. Maybe they’ll even be dreams I can talk about!! Hey, Cutie! Any suggestions on a book to read?! No, but I know there are several good ones out there……. I’ll have to check out the library. Hugs!! Thanks, Liz! I’m glad I’m not alone in that thought! I definitely vote more coffee. everything just makes sense with more coffee. and I’m so glad you’re enjoying the book!! it was a stupendous story. More Coffee, More Coffee! The book is incredible! I need to get back to it!! Allie, Sweetie, I’m sorry! If I could send you a cup of DD I would! I could send you a bag of coffee! There! Think about it, I would be happy to do that. The book…try the library, maybe. I was lucky that my friend Kristen had it and was willing to share. I think I’m going to need my own copy, because I think it’s going to be a read again kind of book. I often have very vivid and strange dreams. Often people that I went to school with or haven’t seen in years pop up – it’s so weird! Sarah, I’ve only started drink iced coffe over the last few years, but I really enjoy it!